An earlier box – bewitching ones to come! 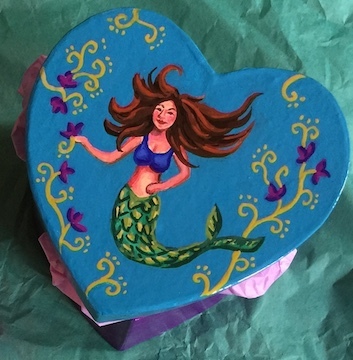 One $40 gift card, two hand-painted heart-boxes (by me) with secret treasure inside, one signed paperback of Dorianna, one signed paperback of Witch of the Cards, one brand new collector Tarot deck along with an envelope full of special greeting cards (with envelopes) designed by me! April 1 – What’s in a Penname? April 1 – Inspirations Behind the Story! April 6 – Guest Blog – TAROT!